As some of you may recall, I parked my noisy, rusty, ugly bike and subscribed to Bixi two months ago. As you can see from my statistics below, I have made the most of the $78 annual subscription, and in just two months, it has cost me less than a dollar a trip. 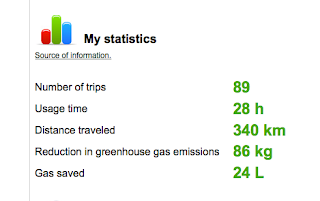 I also found it extremely motivating to see my personal stats. I liked knowing how many kilometres I'd traveled, and I must admit that trying to get to my destination within the first free 30 minutes added a little more fun to the experience. But the best part was not having to find a place to lock up my bike, and it was the perfect way to run multiple errands on the Plateau, where there was no shortage of stations. In these two months, I also had the chance to try the 7-speed Bixi on two occasions. They were faster and more fun. I also had the chance to use the nearly completed bike path on University between Milton and De Maisonneuve. It was certainly welcome and made my daily trek downtown all the more safe. Although there were a few drawbacks, such as arriving at a station with no free docks, the company was relatively quick in finding solutions (In this case, you just reinsert your credit card and you get an additional 15 minutes, enough time to get to the next station without incurring any additional charges.). Towards the end of the season when portions of stations were dismantled for winter, bikes were hard to come by, and checking online beforehand for bike availability was a good way to prevent disappointment. But the best solution is to access the Bixi station map web page with your cell phone, which leads to my next point. You will enjoy Bixi much more if you have a cell phone. In the event you do have a problem, it makes calling customer service much easier. I dealt with customer service on several occasions, and the service was excellent. If the organization had one thing to work on, it would be a better basket. Not only was it less than ideal if you had a cloth bag, but it also required Herculean strength to stretch the bungee cord around the basket to keep your bag in place....The organization has been great with coming up with solutions so far. I didn't realize how much I enjoyed my morning ride until I took the metro on December 1, the day after the Bixi season officially ended. It was hot and crowded with horrific lighting, and people looked sick, tired and generally grumpy all around. I wanted off. A few years ago, I actually enjoyed taking the metro. It sure beat driving. But now I miss my morning endorphin rush, the fresh air and the view of the mountain (especially in the fall). I wish that Bixi would start a winter pilot project on the main cycling paths. A friend told me a few months ago that her quality of life went down in the winter because she couldn't ride her bike. I couldn't agree more. I guess I've become older, wiser and a high-on-lifer. : Bixi: High On LiferTweet this!